In 2009, we were contacted by the National Holistic Institute (NHI), the largest massage therapy school in California – currently with nine campuses across the state. At that time, NHI came to us via a referral from an existing client requesting to help their school achieve the #1 organic listing on Google in all of California for the keyword ‘massage school’. We took on their project, celebrated in many successes, and today we are honored to be an integral partner in defining their core business operations and strategy. NHI had 4 requests: 1) get more leads, 2) increase conversions, 3) lower cost-per-click, and 4) rank for their most important keywords in California. NHI is now ranked #1 to #3 on the first page of Google for their top 16 keywords. They increased their organic visitors by 400%. Site conversions have increased by 20% while CPC has decreased by 26%. After some extensive research, we determined there were 16 other equally valuable keywords that NHI should be targeting as aggressively as ‘massage school’. These 16 keywords accounted for 70% of their entire organic and paid search lead flow compared to 200 other longer tail keywords that accounted for the remaining 30%. These optimizations led to a 400% YOY increase in organic visitors and weekly leads. After keyword research, we went in and updated title tags, meta description tags, heading tags and existing content to include our 16 new top keywords. We ensured NHI was properly indexed in all of the major search engines through the use of XML sitemaps, pagination, no-indexing tags, and more. We took the opportunity to perform logical internal linking between relevant webpages to improve search engine discovery and site crawl. 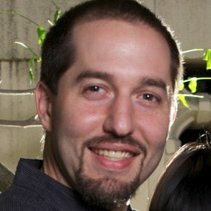 By enabling proper caching on NHI’s sites, we were able to maximize content stored on a visitor’s computer, which reduces the amount of new resources that must be loaded upon site launch. By improving overall user experience, we were able to increase site visit duration, decrease bounce rate, and generate more student leads. We helped NHI re-organize their website, including navigation and all of their content from their Homepage all the way to their “Thank You” pages. 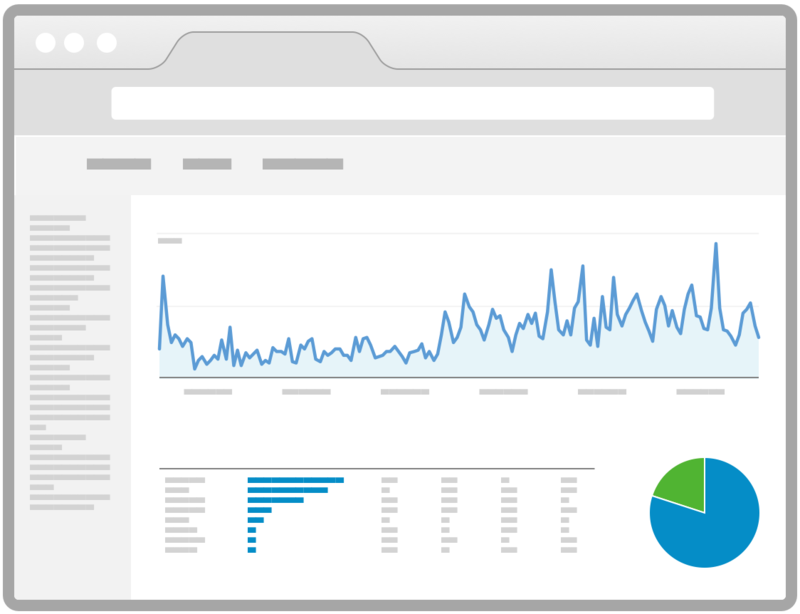 We seamlessly integrated NHI’s site analytics into their existing sophisticated KPI tracking model. By tracking the life of a lead from start to finish, we’re able to see which campaigns are performing, which content needs to be adjusted, and what pages convert best. We went in deep to understand who NHI’s target student is. Where did they come from, what did they like to do, what financial situation are they in, and what are their goals in life. This gave us the information to effectively market to multiple ideal target demographics. At the end of our third month working on NHI’s SEO projects, we had achieved a #2 ranking for ‘massage school’, finally hitting the #1 spot at month number five. Here are additional things we did to get there. We then looked closely at longer keyword phrases that their visitors were using to find their website. We identified and optimized for several phrases that made an immediate impact on traffic numbers. 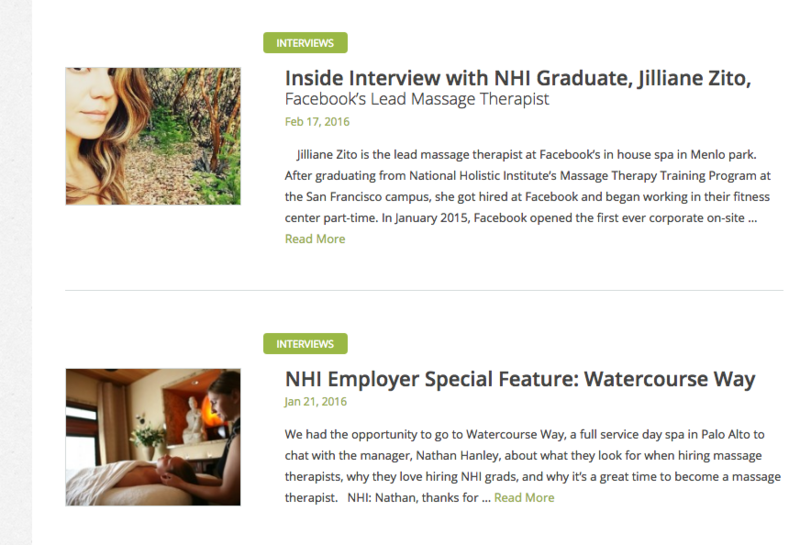 We worked hand-in-hand with NHI to create and optimize 25 useful articles about massage therapy. The project effectively doubled the total number of web pages and word count across their domain while keying in on primary keywords and themes. With the new content, we began the task to acquire high quality links from authoritative domains. NHI is an expert in massage therapy and our goal was to ensure that they are recognized as one. Pleased with our work, NHI selected us to manage their Google AdWords Pay-Per-Click campaigns that had been previously managed by another agency. We’ve generated results and are now their main advertising agency for all things digital including: Facebook, LinkedIn, etc. 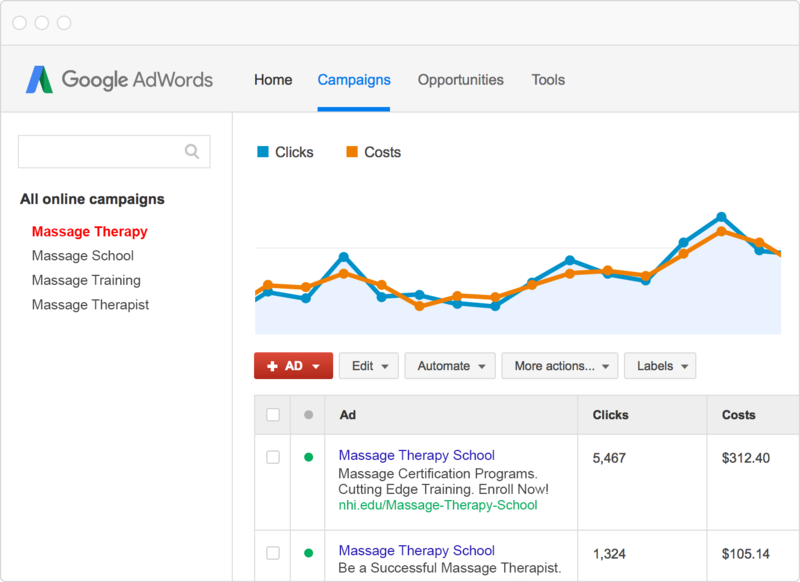 As a Google AdWords Partner, we took the opportunity to rebuild their entire AdWords campaign. Two months later, their cost per click decreased by 26%, with an increase in conversions by 20%. Despite the well noted yearly inflation (5-8%) of costs for advertising on Google since inception in 2006, NHI continues to pay a lower cost per conversion, with increased conversions, than when they did when we took over for the previous agency back in 2009.